Adding to the already crowded market of large phone ie. phablets, Swipe Telecom in partnership with MTV has launched their new entrant,”Swipe MTV Volt 6″ Phablet in the Indian market. 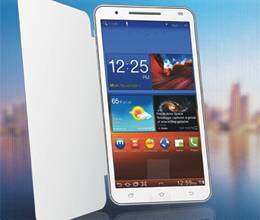 The Price of Swipe MTV Volt 6 inch Phablet is Rs 12,999 which is quite a good deal to offer at such a price tag. It appears like other budget gadgets providers Swipe aims to provide customers with an enriched computing experience with pertinent efficiency, accuracy and performance at an affordable costs. And this device is no exception, unfolding the Display Specifications, Swipe MTV Volt 6 as the name characterize sports with 6-inch capacitive 5-point multi-touchscreen display with 854 x 480 pixels resolutions. Under the hood, this device runs on Android 4.1 Jelly Bean Operating System powered with a Dual Core MTK 6577 Processor clocked at 1 GHz which is a common sight in budget dual core smartphones or tablets, it comes with 512 MB DDR3 RAM which make it quite quite acceptable though there are competitors available in the market now providing 1GB RAM in such price range. Dealing with the device dimensions it weighs 239 gms and measures 158.5×88.6×11.3mm approximately . Lighting towards it’s Storehouse, Swipe MTV Volt dubbed with 4 GB of internal storage which can be expanded upto 32 GB via micro SD slot. Bagged up with Dual-Sim (GSM+GSM) dual standby technology accompanying all the other domestic manufacturer’s who aims in baptizing their devices with Dual Sim technology. Enumerating towards the Photography, it comes 8 MEGAPIXEL of primary camera with LED flash enabling the user to capture image at dark vision along with primary it also packed up with 1.3 MEGAPIXEL of secondary camera. Briefing it Connectivity Specifications, Spice MTV Volt support 3G, WiFi 802.11 b/g/n, Bluetooth 4.0, GPS micro USB port and 3.5mm jack, apart from this it is pre-loaded with a TV player built in with access to MTV (If you love watching MTV then this could turn out to be your portable TV entertainment on the move). To power it up, this device equipped with 3200 mAh of battery though information regarding the standby time is not yet available. The device is already available in various online retain store. For more Information Keep Updated with us. Overall, it’s good but i would expect the RAM could be a bit more then 512MB .